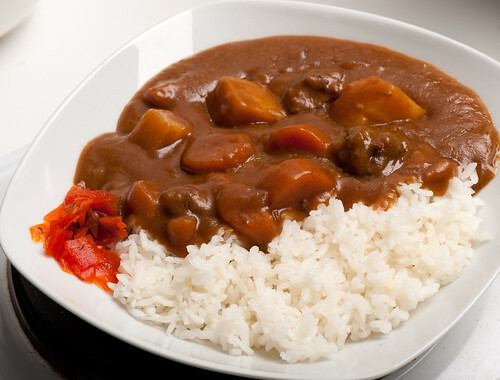 Japanese curry hotness levels, and my favorite childhood curry. 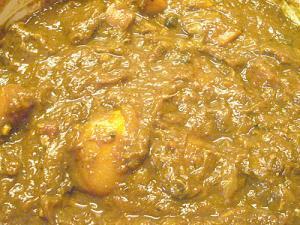 Here's another very easy 'dry' type curry dish that's a favorite in our house, though it's not Japanese. Kedgeree is a very British dish, that doesn't seem to be well known outside of the U.K. It was originally created by the British colonists in India, who took the spices and grain of the land they were in with the smoked haddock from their homeland. It used to be served for breakfast, but nowadays it's a supper dish. This version of kedgeree uses quinoa as the grain (technically it's a seed but it's used as a grain in cooking, so that's what I'll call it). 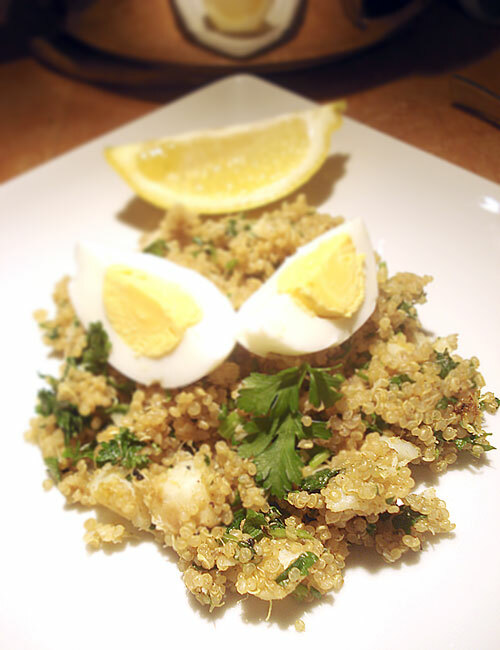 Quinoa has a unique bubbly texture and a neutral flavor that takes on any flavors added to it. It's also very filling, which makes it rather ideal when you're trying to watch the intake. It's very easy to cook, and never seems to go too watery and so on. I'm just a recent convert to quinoa, but I love it already and have it at least a couple of times a month. I've used cod as the fish here but you can use any fish you like, even canned tuna or salmon. It doesn't taste 'fishy' in any way - the lemon and the curry take care of that. The key to making this kedgeree taste fresh and bright is to add tons of parsley (instead of the traditional coriander) and lemon juice. It turns into something that's like a warm, spicy dinner salad. To keep the whole healthy thing going I've used olive oil instead of butter. Any leftovers store nicely in the fridge, and like the previous dry curry makes a great obento lunch too. 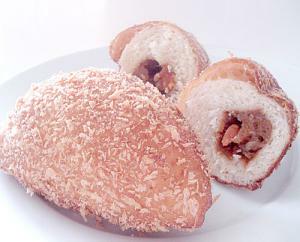 It tastes fine cooled or at room temperature. 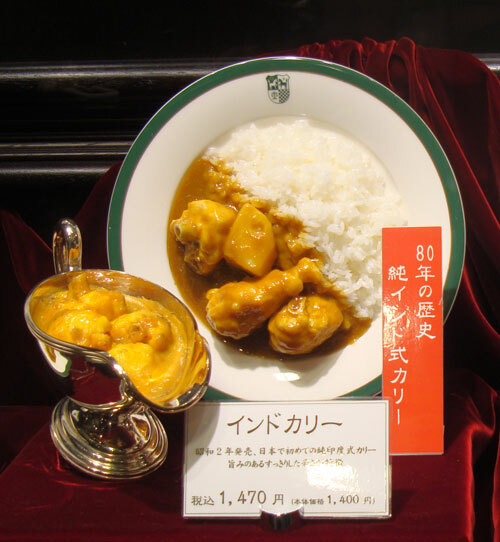 While the standard curry dish in Japan is a kind of curry stew served on plain rice, dry curry, which is a sort of fried rice with curry flavor, is almost as popular. 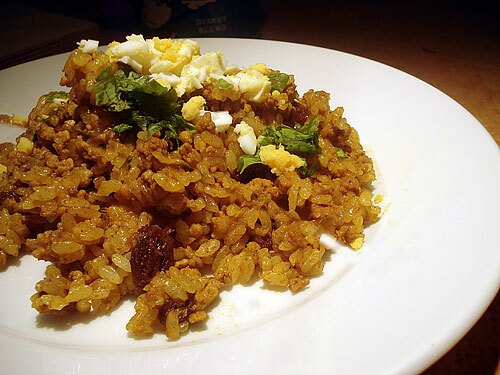 And unlike the stew-type of Curry Rice it's very fast and easy to put together. 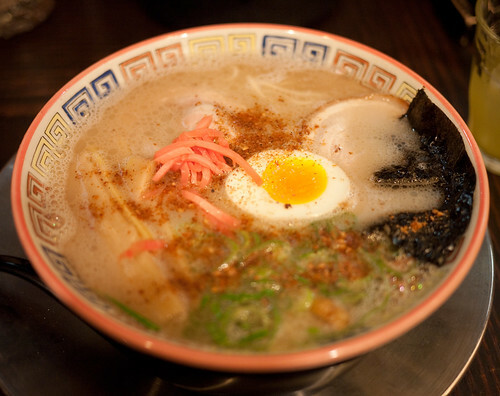 What makes it Japanese really is the use of _japonica_ (medium-grain) rice. 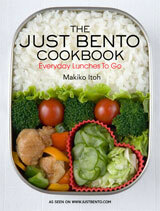 Dry curry made with Japanese rice makes a great obento lunch, tasty at room temperature or warmed up in the microwave. The stick-together moist quality of the rice keeps it edible where a dryer stay-apart rice like basmati might taste too dry. Dry curry also has the mixture of sweet and savory, which appears quite a lot in Japanese food, especially the kind that comes from the Kanto (Tokyo-area) region where my family is from. As I wrote in the Beef Curry recipe, I don't make my own curry powder. Lomo asked in the comments about the "secret" 15 to 20 spices that make up curry powder. After poking around a bit on Japanese web sites, I came up with this page that describes what goes into S & B curry powders, the most popular brand by far in Japan. It's an official S & B page, so should be accurate, though as you can see the percentage given have a pretty wide range. I guess it's because the actual formulas are 'secret'. In any case it gives a starting point for any experimentation I think. I've also included a recipe for making garam masala. Note that I make no claims whatsoever that these are authentic mixes for Indian or other curries, but I'm talking here about Japanese curry.